An area of glaze loss as per photos. Made in Austria by Gmundner Keramik. " Gmundner Keramik. Marks on the base with the GK flower pot logo Fine quality collectors item with a practical purpose as a flower vase. Made In Austria". Attractive hand painted floral design on the front and the back. Dark brown inside. In very good condition apart from a shallow chip to the base. Beautiful black pot created in Austria by Gmundner Keramik. Stunning pattern around the rim of the pot. Good condition with a few small flaws mostly little splashes. A decorative small ceramic vase with flower decoration. It says Wechsler Tirolkeramik, Schwaz, Austria underneath also has number 730 BD. They date to the very early 20th century c1905 and have studded handles and reticulated round bosses to the bodies. The colours are in muted greens and blue over an off white ground. The design is quite uncommon so finding a pair is a very nice bonus. There is further decoration around the vase. Has influences from both the ART NOUVEAU and ART DECO PERIODS. Has influences from both the ART NOUVEAU and ART DECO PERIODS. Grab yourself a Bargain. Gollico Fayence Osterr Edel Keramik. Austria 1158/22. Very good clean condition, see photos. A lovely antique vase by Royal Vienna, Austria. It has a hand painted floral pattern that is raised as if embossed, very lovely. Condition: There is a small firing line on the rim, factory-produced. 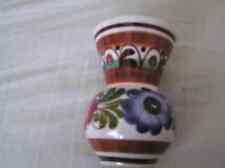 Small decorative pottery/majolica jug from famous Gmunden Keramik, Austria. Red with green pattern. SMALL CHIP TO TIP OF HORN - IN GOOD CONDITION. 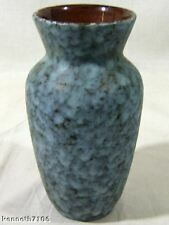 Glaze is semi-matte mottled blue-gray green with brownish specks. Clean fine condition. Here's a great piece up for sale. Bottom has raised lettered "AUSTRIA 663-18". Beautiful color & texture on side really set this piece off. Inside is a brown glaze. I have not done any cleaning to this item as this is best left for the collector to decide (non really needed), I believe it held dry artificial flowers for the last 40 years. This butter dish has delicate blue flowers and lovely filigree type designs moulded into the dish. There are also splashes of yellowish-green as an accent color. The butter dish weighs about 200 grams. This one is in Excellent Condition with No Cracks No Crazing, NOTE: There is a small hard to notice chip on the inside of the spout (SEE picture with pen). Very nice Leonard Vienna pitcher. It has birds and cotton plant around the sides. Leonard Vienna Austria Ceramic Pottery Candy Dish With Handles 8 1/2"
For your consideration is this Leonard Vienna Austria Ceramic Pottery Candy Dish With Handles. It is in nice condition with minor wear. Amphora Austria Turn stamp Paris 1900 Dragon Bowl amazing peace from Exhibition. This is stamp Paris 1900 so i think its one of Exhibition peaces .not in grate shape .please see pictures . Dispatched with Royal Mail 2nd Class. This is the mark of Moritz Zdekauer. Lovely Hand Painted Oval Dish marked MZ Austria. 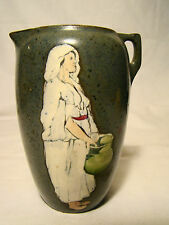 A lovely Austrian Amphora ware Art Nouveau vase. Underneath base has a ' Gmundner Keramik Austria' sticker and possibly '9004'?. Coaster 12cm wide. dish 11cm wide x 3cm deep. GMUNDNER KERAMIK AUSTRIA 1194-9. Fat Lava Jug - Neu Solo Design. Chocolate under glaze with Burnt Orange and Creamy Ivory Lava. I take pictures outdoors to give as much natural light as possible. I am not a professional photographer. Fantastic piece made by Gmunder Keramic in Austria. huge and and heavy piece. 87cm/ 34.5”circuit in the widest point. Very impressive. Vintage MZ Austria Trinket Dish. Crazing to glaze surface along with the usual firing faults. Very pretty handmade 'Handarbeit Aus Gmunden' Austrian crackle glaze dish. Possibly 1970s?. Good condition. 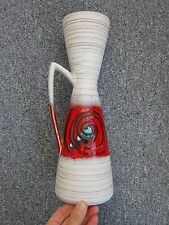 This rare form of Liezen Keramik Austrian pottery is in the shape of. It is marked on base AUSTRIA. There are a few minor nibbles to the flower edges, and one minor nibble to the rim. GMUNDER KERAMIK AUSTRIA . DECORATIVE LIDDED POT. QUITE OLD. FULLY MARKED. GMUNDER KERAMIK AUSTRIA. FULLY MARKED. ALSO IMPRESSED 419?. HAS TO GO. WOULD MAKE A GREAT ADDITION TO ANY COLLECTION. Wechsler - Tirolkeramik Schwaz Austria. DECORATIVE FLORAL WALL PLATE. Can be used on the table. Lovley old dog, no chips, I always thought it was a great Dane but apparently it's a boxer. 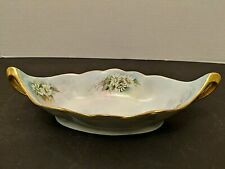 A rare Austrian oval shaped dish with hand painted Scattered Blooms design. Depth 5 cm. HAND- PAINTED. MADE IN AUSTRIA. APPROXIMATE SIZE : HEIGHT 15CM; WIDTH AT WIDEST 11CM; WIDTH OF RIM AT TOP 7.5CM. STAMP TO BASE. IN GOOD CONDITION. Gmundner Keramik Austria - Decorative Lidded Pot - Has some age - Fully marked. Gmundner Keramik Austria - Decorative Lidded Pot with Floral pattern lid. ERNST WAHLISS TURN WEIN LADY STANDING WITH READING BOOK, AUSTRIA. Add to Favourites. We Accept Only. Royal Brierley. Why Choose Us ?. Royal Doulton. Usefull Link. Royal Scot. 2 Vintage Austria Turquoise and White Pottery Vases. Both are different in style, but similar in pattern and colour. They are made in Germany, although they bear the name Austria. x1 is numbered 664-18 & the other 1256-18, the latter being the one with the label. They are both in excellent condition with no chips or cracks anywhere. The vases are decorated with colourfully paintedBirds & gilt accents. Embossed 'AUSTRIA 38' on the base. Size of each vase is approx. 6.5" tall X 3.5" wide.